1. Mix sugars and salt together. Using a coffee or spice grinder, grind the remaining seasonings into a fine powder and incorporate that powder into the sugar/salt mixture. In the bottom of a large, non-reactive container (glass or plastic is best), spread about 25 percent of the cure down to create an even layer. 2. Next, lay the fish down (skin side down) evenly on top of that. Then, sprinkle the rum or vodka evenly over the surface of the fish. Lay the sprigs of fresh dill over the fish evenly, covering its entire surface. After that, use all the remaining cure to cover the fish entirely, patting it gently to make sure no part of the surface of the fish is not covered. Some dill will poke through, which is no big deal. 3. Cover all the fish with plastic wrap, then place a cutting board or other flat surface on top of that to create a press. Place a couple of #10 cans (3-4 pounds of total weight) on top of the press. 4. Place the entire container in the refrigerator and let the fish cure for 24-72 hours. The thicker the fish, the longer it must cure. Small pieces usually take no more than 24 hours. Large pieces can take up to 72 hours. Check after 24 hours and then every 12 hours after that until the fish is cured though. It should still be supple and moist but not raw-feeling. 5. Once the cure is completed, rinse the fish off thoroughly with cold water and dry it off. Place the cured fish on a rack, so it can dry further from above and below, and refrigerate it for 24 hours to create a pellicle, which will help the fish take on the smoke. 6. 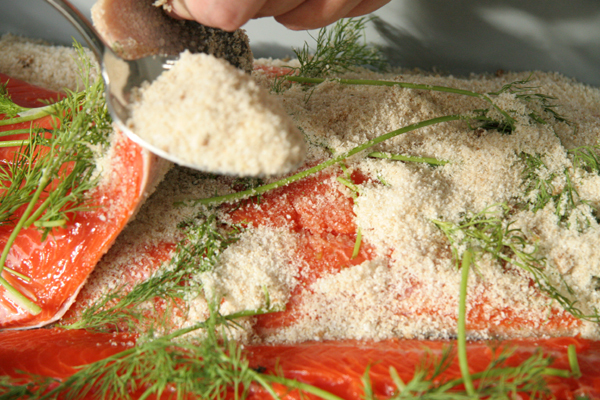 Once the pellicle has developed, cold-smoke the fish indirectly with apple wood (or other wood of your choice). The smoke should not be above 100 degrees F. as it comes in contact with the fish. If the smoke gets hotter than that, it’ll cook the fish, instead of cold-smoking it. The fish must be kept cold during this process to prevent spoilage. This can be accomplished by smoking only during cold weather, or putting the fish on a rack above a tub of ice. 7. Fish can be smoked for any duration of time, depending on your preference for smokiness. I generally try for about six hours but even two will produce a good, smoky result.